The draws are posted for next week’s Swiss Indoors in Basel, Switzerland. The field is strong, with five of the top eight players entered. Andy Murray, after whining about scheduling and players needs (rest, less mandatory events, appearance fees, off season, etc) has played three consecutive tournaments, winning all, and has also taken a wild card for next week. Have a look at the draws below. 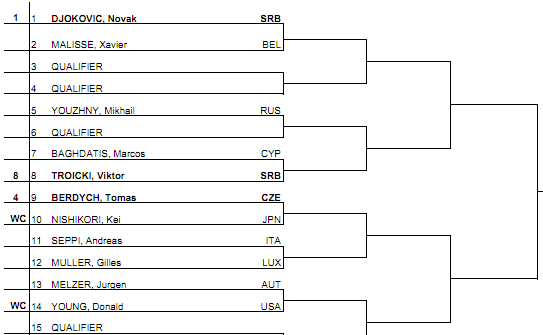 Novak Djokovic is the #1 seed and in the top half of the draw. Roger Federer is placed in the bottom half of the draw, seeded #3. Federer faces a tough path to his fifth title in Basel, as he did last year when he defeated Djokovic in the final. This year’s tricky route begins with a first round match against the Italian, Potito Starace. His potential opponents in the early rounds also include Nieminen and Stepanek. 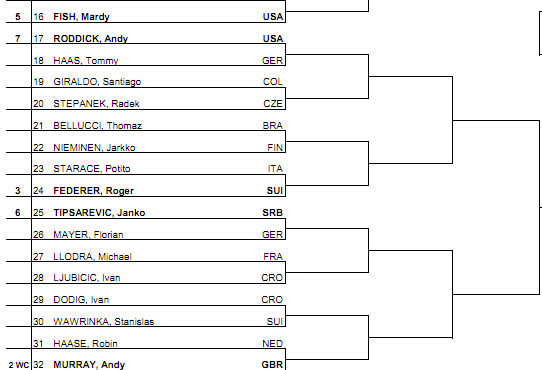 Beyond that, according to seeding, is Roddick in the quarterfinals, Murray in the semifinals, and Djokovic in the final. Roger plays Monday at the Swiss Indoors in Basel, Switzerland. Track the Federer Express with RF Activity. Next week and into the month of November will (hopefully) bring some big news here on FedererFan07. Spread the word. To be IN on the upcoming big news, sneak peaks, and more, you must be connected on both Facebook and Twitter. Stay tuned! Link up with FedererFan07 on Facebook and Twitter.